The S.T.A.R.T. 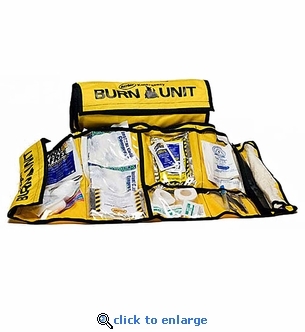 One Burn Unit is a first aid kit designed specifically for rendering immediate first aid to a burn victim. The clearly marked black roll-out bag means you can start treatment quickly by avoiding searching for the proper first aid treatments in a general first aid kit. This Simple Triage And Rapid Treatment (START) burn kit makes a great addition to CERT kits and workplace emergency kits. NOTE: Comes in a Black Roll-Out Bag. Yellow Bags are only available for orders of 25 or more.